본 발명의 복수의 페이지들을 포함하는 플래시 메모리의 트리 구조에 기반한 색인 방법은, 리프 노드 내 엔트리 및 리프 노드를 지정하는 인덱스 노드 내 엔트리를 동일한 페이지에 저장하되, 페이지에 저장되는 리프 노드 내 엔트리들의 수 및 인덱스 노드 내 엔트리들의 수에 근거하여 페이지에서 리프 노드 내 엔트리 및 상기 인덱스 노드 내 엔트리가 각각 저장될 수 있는 최대 개수를 변경한다. Index method based on a tree structure of a flash memory including a plurality of pages of the present invention, but store the entry index node to specify a leaf node in the entry and the leaf nodes on the same page of the entry leaf node is stored in the page based on the number and the number of entries in the index node to change the maximum number of entries in the leaf node and the entry in the index node from the page be stored, respectively. 본 발명은 플래시 메모리에 관한 것으로, 좀 더 구체적으로는 플래시 메모리를 위한 색인 스킴에 관한 것이다. The present invention relates to a flash memory, and more specifically relates to an indexing scheme for a flash memory. 플래시 메모리 장치는 메모리 칩 안에 정보를 유지하기 위해 전력이 필요없는 비휘발성 메모리 장치이다. The flash memory device is a non-volatile memory device that does not require power to maintain the information in the memory chip. 게다가, 비록 퍼스널 컴퓨터에서 메인 메모리로 사용되는 DRAM만큼 빠르지는 않지만, 플래시 메모리 장치는 읽기 속도가 빠르며 하드디스크보다 충격에 강하다. In addition, although not as fast as DRAM that is used as main memory in a personal computer, a flash memory device is fast, the read speed is strong to impact than the hard disk. 이러한 특징으로 인해 배터리로 동작하는 디바이스에서 저장 장치로서 많이 사용되고 있다. Because of this feature is widely used as a storage device in a device operating on batteries. 플래시 메모리 장치의 또다른 매력은 강한 압력이나 끊는 물에 견딜 만큼, 물리적 수단으로 거의 파괴되지 않는다는 점이다. Another attraction of the flash memory device is that it does not substantially destroyed by physical means to withstand the strong pressure or boiling water. 플래시 메모리 장치는 전기적으로 데이터를 지우고 재기록이 가능한 비휘발성 컴퓨터 기억 장치를 말한다. Flash memory devices, electrically erase data refers to non-volatile computer memory is rewritable. EEPROM과 다르게, 플래시 메모리 장치는 블록 단위로 지우고 쓰기가 가능하다. Unlike the EEPROM, flash memory devices, it is possible to write to erase a block-by-block basis. 플래시 메모리 장치는 EEPROM보다 비용이 덜 들기 때문에 대용량의 비휘발성, 고체상태(solid-state) 스토리지가 필요한 경우 주로 사용된다. Flash memory devices may have a large amount of non-volatile, solid state (solid-state) storage is required because less expensive than EEPROM lifting is mainly used. 대표적인 활용 예로 디지털 음악 재생기, 디지털 카메라, 핸드폰을 들 수 있다. Typical examples can be utilized in digital music players, digital cameras, and mobile phones. 일반적인 데이터를 저장과 컴퓨터간에 데이터를 옮기는 용도로 USB 드라이브를 많이 사용하는데, 이때도 플래시 메모리 장치가 사용되고 있다. In popular USB drives the common data for the purpose to transfer data between a storage and a computer, this time is also used, the flash memory device. 자기 디스크를 기계적으로 구동시켜 데이터를 읽고 써야 하는 하드디스크는 구조적으로 속도 향상에 어려움이 있다. It drives the magnetic disk is mechanically hard disk to read and write data has a structural difficulty in speed-up. 최근에는 고용량 저장 장치로서 하드디스크 대신 플래시 메모리를 사용하고자 하는 노력들이 계속되고 있다. Recently, there have been continued efforts to use flash memory instead of a hard disk as a high capacity storage device. 특히 플래시 메모리 장치에 부트 코드를 저장하는 경우 시스템의 부팅 속도가 빨라지는 장점이 있다. In particular, there is a boot up of the system the advantage of faster when it stores the boot code in the flash memory device. 본 발명의 목적은 성능과 내구성이 향상시킬 수 있는 플래시 메모리를 위한 색인 방법을 제공하는데 있다. The purpose of the present invention to provide a method for indexing the flash memory to improve performance and durability. 이와 같은 목적을 달성하기 위한 본 발명의 특징에 의하면, 복수의 페이지들을 포함하는 플래시 메모리의 트리 구조에 기반한 색인 방법은: 상기 트리 구조는 리프 노드 및 인덱스 노드를 포함하며, 상기 리프 노드에 대한 정정 명령을 수신하는 단계, 그리고 상기 리프 노드 내 엔트리 및 상기 리프 노드를 지정하는 상기 인덱스 노드 내 엔트리를 동일한 페이지에 저장하는 단계를 포함한다. According to this aspect of the present invention to achieve the object, the index method based on a tree structure of a flash memory including a plurality of pages is: wherein the tree structure includes leaf nodes and index nodes, correction for the leaf node and a step, and storing the entry in the index node the leaf node that specifies the entry and the leaf nodes on the same page comprising: receiving a command. 상기 저장 단계는, 상기 페이지에 저장되는 상기 리프 노드 내 엔트리들의 수 및 상기 인덱스 노드 내 엔트리들의 수에 근거하여 상기 페이지에서 상기 리프 노드 내 엔트리 및 상기 인덱스 노드 내 엔트리가 각각 저장될 수 있는 최대 개수를 변경한다. The storing step, the maximum number in the number of the entry the leaf node is stored in the page and the page on the basis of the number of the entry the index node is a leaf node, the entry and the entry the index node may be stored in each the changes. 이 실시예에 있어서, 상기 플래시 메모리는 상기 페이지 단위로 독출 또는 기입된다. In this embodiment, the flash memory is written or read by the page unit. 이 실시예에 있어서, 상기 인덱스 노드는 적어도 하나의 리프 노드를 지정한다. In this embodiment, the index node is to specify at least one of the leaf nodes. 이 실시예에 있어서, 상기 페이지에 복수의 인덱스 노드들이 포함될 때 상기 인덱스 노드들 중 최상위 노드는 루트 노드이다. In this embodiment, when a plurality of index nodes included in the page top node of said index node is a root node. 이 실시예에 있어서, 상기 저장 단계는, 상기 정정 명령이 상기 리프 노드에 새로운 엔트리를 삽입하는 명령일 때, 상기 리프 노드가 가득 찼는 지를 판별하는 단계와, 상기 리프 노드가 가득 찼을 때, 상기 리프 노드를 제1 및 제2 리프 노드들로 분할하는 단계, 그리고 상기 분할된 상기 제1 및 제2 리프 노드들 중 어느 하나에 상기 새로운 엔트리를 삽입하는 단계를 더 포함한다. In this embodiment, the storing step, the correction command when the command for inserting a new entry in the leaf node, when the step of determining whether the full or the leaf nodes, the leaf node is full, the leaf dividing the nodes into the first and second leaf nodes, and further includes the step of inserting a new entry in the any one of the divided first and second leaf node. 이 실시예에 있어서, 상기 저장 단계는, 상기 리프 노드가 상기 제1 및 제2 리프 노드들로 분할될 때 상기 인덱스 노드가 가득 차는 지를 판별하는 단계와, 상기 인덱스 노드가 가득 찰 때 상기 리프 노드에 상기 새로운 엔트리를 저장할 여유 공간이 있는 지를 판별하는 단계, 그리고 상기 리프 노드에 여유 공간이 있을 때 소정의 변경 비율로 상기 페이지에서 상기 리프 노드 내 엔트리 및 상기 인덱스 노드 내 엔트리가 각각 저장될 수 있는 최대 개수를 변경하는 단계를 더 포함한다. In this embodiment, the storing step, when the leaf nodes of the first and the second comprising the steps of: determining whether the index node is teeming when divided into a leaf node, the index node is full, the leaf-node in the store a new entry in the step of determining whether there is free space, and that the entry the leaf node in the entry and the index node from the pages at a predetermined rate of change when there is a free space to the leaf node can be stored in each further comprising the step of changing the maximum number. 이 실시예에 있어서, 상기 저장 단계는, 상기 인덱스 노드가 가득찼고, 상기 리프 노드에 상기 새로운 엔트리를 저장할 여유 공간이 없을 때 상기 인덱스 노드를 분할하는 단계, 그리고 상기 인덱스 노드의 분할 횟수를 카운트하는 단계를 더 포함한다. In this embodiment, the storing step, kicked filled with the index node, the method comprising: dividing the index node when storing a new entry above the leaf node there is no free space, and which counts the divided frequency of the index node the step further comprises. 이 실시예에 있어서, 상기 저장 단계는, 상기 리프 노드가 분할될 때, 상기 리프 노드의 분할 횟수를 카운트하는 단계와, 상기 인덱스 노드가 가득차지 않았을 때, 상기 인덱스 노드의 분할 횟수와 상기 리프 노드의 분할 횟수의 비가 소정값보다 큰지 비교하는 단계, 상기 인덱스 노드의 분할 횟수와 상기 리프 노드의 분할 횟수의 비가 소정값보다 크지 않을 때, 상기 리프 노드에 상기 새로운 엔트리를 저장할 여유 공간이 있는 지를 판별하는 단계, 그리고 상기 리프 노드에 여유 공간이 있을 때 상기 인덱스 노드 내 엔트리가 저장될 수 있는 최대 개수가 증가하도록 상기 페이지에서 상기 리프 노드 내 엔트리 및 상기 인덱스 노드 내 엔트리가 각각 저장될 수 있는 최대 개수를 변경하는 단계를 더 포함한다. In this embodiment, the storing step, the leaf time a node is split, and when counting a divided frequency of the leaf node, the said index node would be full, division number and the leaf node of the index node step of dividing the number of times the ratio of the comparison is greater than a predetermined value, when the division number of the divided frequency and the leaf node of the index node ratio not more than the predetermined value, determines the leaf node if there is the store a new entry space phase, and up to the number in the page is the leaf node, the entry and the entry the index node may be stored, respectively to increase the maximum number with the entry the index node may be stored when there is a free space to the leaf node that a further comprises the step of changing. 이 실시예에 있어서, 상기 인덱스 노드의 분할 횟수와 상기 리프 노드의 분할 횟수를 비교하는 단계는, (상기 인덱스 노드의 분할 횟수)/(상기 리프 노드의 분할 횟수)가 (1-리프 노드의 크기 비율)/(리프 노드의 크기 비율)보다 큰 지를 비교하는 단계를 포함한다. In this embodiment, the step of comparing the number of division of the divided frequency of the index nodes and the leaf nodes, (the number of division of the index nodes) / (the number of division of the leaf node) is (the size of the 1-leaf node ratio) / (comprises the step of comparing whether the size is greater than the percentage of the leaf nodes). 이 실시예에 있어서, 상기 저장 단계는, 상기 정정 명령이 상기 리프 노드에 포함된 엔트리를 삭제하는 명령일 때, 상기 엔트리의 삭제에 의해서 상기 리프 노드가 비는 지를 판별하는 단계와, 상기 리프 노드가 비게 될 때 상기 리프 노드를 삭제하는 단계와, 상기 루트 노드의 사용률이 기준값 미만인 지를 판별하는 단계, 그리고 상기 루트 노드의 사용률이 상기 기준값 미만일 때 상기 리프 노드 내 엔트리가 저장될 수 있는 최대 개수가 증가하도록 상기 페이지에서 상기 리프 노드 내 엔트리 및 상기 루트 노드 내 엔트리가 각각 저장될 수 있는 최대 개수를 변경하는 단계를 더 포함한다. In this embodiment, the storing step, the correction command when the command to delete the entries contained in the leaf nodes, said method comprising by the deletion of the entry to determine whether the ratio of the leaf nodes, the leaf node is the maximum number of steps of the method for deleting the leaf node, the utilization of the root node to determine whether the reference value is less than, and the utilization of the root node may be when less than the reference value is the entry the leaf node storage when empty, the step of changing the maximum number in which the leaf node in the entry and the entry of the root node can be stored in each of the page so as to increase further includes. 이 실시예에 있어서, 상기 루트 노드의 사용률이 기준값 미만인 지를 판별하는 단계는, 상기 루트 노드에 저장된 엔트리의 수가 상기 루트 노드에 저장될 수 있는 최대 엔트리의 수의 50% 미만인 지를 판별하는 단계를 포함한다. In this embodiment, the step of the utilization of the root node to determine whether the reference value is less than the, including the step of determining whether number of less than 50% of the maximum entry in the number of entries stored in the root node can be stored in the root node, do. 이 실시예에 있어서, 상기 페이지에서 상기 리프 노드가 차지하는 크기 비율은 제1값보다 작거나 같고, 제2값보다 크거나 같으며, 상기 저장 단계는, 상기 제1 및 제2값들에 범위 내에서 상기 리프 노드 내 엔트리가 저장될 수 있는 최대 개수가 변경되도록 상기 리프 노드 내 엔트리 및 상기 루트 노드 내 엔트리가 각각 저장될 수 있는 최대 개수를 변경하는 단계를 포함한다. In this embodiment, in said page size ratio is the leaf node occupies is equal to or less than a first value, was the greater than or equal to the second value, wherein the storing step, the extent of the first and second values, the leaf is the maximum number with the entry node can be stored for the changes includes the step of changing the maximum number in which the leaf node in the entry and the entry of the root node can be stored, respectively. 이 실시예에 있어서, 상기 페이지들 각각은 상기 리프 노드의 엔트리 및 상기 인덱스 노드의 엔트리를 최대 n(n는 양의 정수)개 저장한다. In this embodiment, the page of each store up to n (n is a positive integer) pieces of entry and an entry of the index node of the leaf node. 이와 같은 본 발명에 의하면, 플래시 메모리의 한 페이지에 μ*-트리의 리프 노드 및 리프 노드와 관련있는 인덱스 노드들을 저장하고, 리프/인덱스 노드에 대한 정정, 삽입, 또는 삭제를 수행할 수 있다. Thus, according as the present invention, a page of the flash memory μ * - it is possible to store the index node associated with the leaf nodes and leaf node in the tree and perform the leaf / correction for the index node, inserted, or deleted. 또한 리프 노드 및 인덱스 노드 각각에 저장된 엔트리들의 수에 근거하여 정정, 삽입, 또는 삭제 동작시 페이지 레이아웃을 변경할 수 있다. Also you can change the correction, insertion, or deletion operation when the page layout based on the number of entries stored in each of the leaf nodes and index nodes. 도 9는 페이지 내에서 리프 노드가 차지하는 크기 비율(p 1 )의 최적값을 보여주는 도면이다. 9 is a diagram showing the optimum value of the size ratio is a leaf node within the page occupies (p 1). 도 10a 내지 도 10c는 리프 노드에 새로운 엔트리가 삽입될 때 페이지 레이아웃의 변경을 예시적으로 보여주는 도면들이다. Figure 10a to Figure 10c are diagrams showing a change of page layout when a new entry is inserted in the leaf node by way of example. 도 11은 플래시 메모리의 리프 노드에 새로운 엔트리를 삽입하는 동작을 보여주는 플로우차트이다. 11 is a flowchart showing the operation of inserting a new entry in the flash memory, the leaf node. 도 12a 내지 도 12c는 리프 노드의 엔트리가 삭제될 때 페이지 레이아웃의 변경을 예시적으로 보여주는 도면들이다. Figure 12a to Figure 12c are diagrams showing a change of page layout when the entry in the leaf node to be deleted by way of example. 도 13은 플래시 메모리의 리프 노드 내 엔트리를 삭제하는 동작을 보여주는 플로우차트이다. 13 is a flowchart showing the operation for deleting the entry of the flash memory, the leaf node. 도 14는 B-트리, μ-트리 및 본 발명에 따른 μ*-트리의 벤치마크 결과를 예시적으로 보여주는 도면이다. 14 is μ * of the B- tree, μ- tree and the present invention shows a benchmark of the tree by way of example. 도 15는 본 발명에 따른 μ*-트리에서 페이지 내 리프 노드가 차지하는 크기 비율(p 1 )의 변화를 보여주는 도면이다. 15 is μ * according to the invention shows a change in the size ratio (p 1) in the tree is within the leaf node page occupied. 도 16은 본 발명의 바람직한 실시예에 따른 색인 스킴을 채용한 전자 장치의 구성을 보여주는 도면이다. 16 is a block diagram of an electronic device employing an indexing scheme according to an embodiment of the present invention. 도 17은 본 발명의 바람직한 실시예에 따른 색인 스킴을 채용한 메모리 시스템을 보여준다. Figure 17 shows a memory system employing the index scheme of the preferred embodiment of the present invention. 도 18은 본 발명의 바람직한 실시예에 따른 색인 스킴을 채용한 또다른 전자 장치를 보여준다. Figure 18 shows another electronic apparatus employing the index scheme of the preferred embodiment of the present invention. 이하 본 발명의 바람직한 실시예를 첨부된 도면들을 참조하여 상세히 설명한다. Reference to the accompanying drawings, the following preferred embodiment of the present invention will be described in detail. μ-트리는 B-트리를 변형한 트리 구조로서, 리프 노드(leaf node)와 인덱스 노드(index node)로 구성된다. μ- tree is a tree structure composed of a variation of the B- tree, the leaf node (leaf node) and the node index (index node). 리프 노드와 인덱스 노드 각각은 키(key)와 포인터(pointer)로 이루어진 엔트리(entry)를 포함한다. Each of the leaf nodes and index nodes comprises an entry (entry) consisting of a key (key) and a pointer (pointer). 키 값은 올림차순(asending)으로 정렬될 수 있다. Key values ​​may be sorted in ascending order (asending). 리프 노드는 각 키에 대응하는 데이터가 저장된 위치를 지정하는 포인터를 포함한다. The leaf node includes a pointer that specifies the location data is stored corresponding to each key. 인덱스 노드는 리프 노드에 있는 키 값을 신속하게 찾을 수 있도록 포인터를 포함한다. The index node contains pointers to help you quickly find the key value in the leaf nodes. B 트리와 달리 μ-트리는 리프 노드가 순차적 순서로 링크 리스트(linked list)를 구성하고 있어서 키 값들이 순차적으로 처리될 수 있다. Unlike the B-tree μ- tree leaf node is the configuration according to the key value sequential order linked list (linked list) are to be processed sequentially. 이러한 μ-트리는 하드 디스크와 같은 저장 매체에 저장된 데이터 또는 데이터 베이스를 액세스하는 인덱스(index)로 널리 사용될 수 있다. These μ- tree can be widely used as an index (index) to access the data or databases stored in the storage medium such as a hard disk. 본 발명은 μ-트리에 기반한 새로운 μ-트리를 제공한다. The present invention provides a new μ- μ- tree based on the tree. 도 1은 일반적인 B+ 트리 구조가 플래시 메모리에 저장된 일 예를 보여주는 도면이다. 1 is a diagram showing an example general B + tree structure is stored in the flash memory. 도 1에 도시된 B+ 트리(a)는 높이(height, H)가 3, 리프 노드의 수가 3, 인덱스 노드의 수가 3이다. The B + tree shown in Figure 1 (a) is 3, the number of leaf-node 3, the number of index nodes 3 height (height, H). 즉, 리프 노드는 D, E, F이고, 인덱스 노드는 B, C, A이다. That is, the leaf node D, E, F, the index node is a B, C, A. 인덱스 노드들 중 최상위 인덱스 노드(A)는 루트 노드(root node)라 불린다. The highest index node of the index node (A) is called the root node (root node). B+ 트리의 높이가 1일 때 "루트 노드=리프 노드" 그리고 B+ 트리의 높이가 2 이상일 때 "루트 노드=인덱스 노드"이다. When the height of the B + Tree 1 il is the "root node, the leaf node =" is 2 or greater, and when the height of the B + tree "root node = node index". 인덱스 노드들 각각은 키 값들 및 포인터들을 포함한다. Each index node comprises the key values ​​and pointers. 예컨대, 인덱스 노드(A)는 인덱스 노드들(B, C)의 페이지 어드레스들(P5, P4)을 포함하며, 인덱스 노드(B)는 리프 노드들(D, E)의 페이지 어드레스들(P3, P2)을 포함한다. For example, the index node (A) is the page address of the index nodes (B, C) page addresses includes (P5, P4), the index node (B) is the leaf node (D, E) of the (P3, It includes P2). B+ 트리(a)의 인덱스 노드들 및 리프 노드들 각각은 플래시 메모리(b)의 페이지(page)에 각각 저장된다. B + tree nodes and leaf nodes of the index (a) respectively are stored in each page (page) of a flash memory (b). 일반적으로 플래시 메모리는 블록(block) 단위로 소거되며, 페이지 단위로 독출 및 기입된다. In general, the flash memory is erased on a block-by-block (block) units, it is read out and written by page. 도 2는 B+ 트리 구조에서 어느 한 리프 노드에 대한 수정이 이루어진 후 변경된 B+ 트리 구조 및 플래시 메모리에 저장된 예를 보여준다. Figure 2 shows an example stored in a B + tree structure is changed, and the flash memory after completion of modification for any of the leaf nodes in the B + tree structure. 일반적으로 플래시 메모리에서 이미 데이터가 기입된 셀에 새로운 데이터를 기입하기 위해서는 소거 동작이 수행되어야 한다. In order to write new data to the general data it is already written in the flash memory cell to be carried out the erase operation. 만일 소거 동작 없이 새로운 데이터를 기입하기 위해서는 미리 소거된 새로운 페이지에 데이터를 기입해야만 한다. To ten thousand and one to write the new data without erasing operations must write data to the new page, the pre-erase. 따라서 B+ 트리(c)의 리프 노드(F) 내 키 값을 삽입 또는 삭제하기 위해서는 플래시 메모리(d)의 새로운 페이지(P7)에 수정된 리프 노드(F')를 기입해야 한다. Therefore, the B + tree (c) to the leaf node (F) to the insertion or deletion within the key value to be filled in the leaf node (F ') modify the new page (P7) of the flash memory (d). 인덱스 노드(C)는 리프 노드(F')의 페이지(P7)를 지정하도록 인덱스 노드(C')로 정정되어야 하고, 또한 인덱스 노드(A)는 인덱스 노드(C')가 저장된 페이지(P8)를 지정하도록 인덱스 노드(A')로 정정되어야 한다. The index node (C) is a leaf node (F ') to be corrected as (p (P7) index node C) to point to a', and also an index node (A) is an index node (C ') stored pages (P8) to specify the index to be corrected in the node (a '). 이와 같이 리프 노드(F)에 대한 수정은 리프 노드(F)와 관련있는 인덱스 노드들(C, A)에 대한 수정을 초래한다. Thus, modifications to the leaf node (F) results in modifications to the associated index in the leaf node (F) nodes (C, A). 즉, 어느 한 리프 노드를 수정, 삽입 또는 삭제하기 위해서는 적어도 B+ 트리의 높이(H) 만큼의 기입 동작이 수행되어야 한다. That is, the writing operation should be performed as long as the height (H) of at least B + tree in order to modify, insert, or delete any of the leaf nodes. 일반적으로 낸드 플래시 메모리에서 기입 동작이 독출 동작보다 더 많은 시간이 소요되고, 한 블록당 기입 횟수가 제한적이므로, 색인 구조의 수정에 많은 시간이 소요될 뿐만 아니라 낸드 플래시 메모리의 수명이 단축될 수 있다. In general, the writing operation in the NAND flash memory is more time consuming than a read operation, since the number of times the write-per-block-limiting, may be a NAND flash memory lifetime shortening but also take a long time to modify the index structure. 도 3은 본 발명의 바람직한 실시예에 따른 μ-트리를 플래시 메모리에 저장하는 새로운 스킴을 개념적으로 보여주고 있다. Figure 3 illustrates a novel scheme for storing μ- tree according to an embodiment of the present invention to the flash memory conceptually. 도 3을 참조하면, μ-트리(e)에서 어느 한 리프 노드 및 그 리프 노드와 관련있는 인덱스 노드들은 동일한 페이지에 기입된다. 3, the tree in μ- (e) an index node associated with any one of the leaf nodes and the leaf nodes are written into the same page. 즉, 리프 노드(F) 및 리프 노드(F)의 부모 노드(parent node)인 인덱스 노드들(C, A)은 페이지(P1)에 저장되고, 리프 노드(E) 및 인덱스 노드들(B, A)은 페이지(P2)에 저장되며 그리고 리프 노드(D) 및 인덱스 노드들(B, A)은 페이지(P3)에 저장된다. That is, the leaf node (F) and a leaf node (F) a parent node (parent node) of an index node of a (C, A) is stored in a page (P1), the leaf node (E) and the index nodes (B, a) it is stored in the page (P2) and the leaf node (D) and the index nodes (B, a) is stored in a page (P3). 단, 리프 노드(E) 및 인덱스 노드들(B, A)이 페이지(P2)에 저장될 때, 인덱스 노드(A)가 인덱스 노드들(B, C)이 저장된 페이지를 지정하므로, 페이지(P1)에 저장된 인덱스 노드(A)는 무효화(invalid) 된다. However, since when it is stored in the leaf node (E) and the index nodes (B, A) the page (P2), the index node (A) is specified, the stored pages of the index nodes (B, C), the page (P1 ) the index node (a) stored in the are negated (invalid). 마찬가지로, 리프 노드(D) 및 인덱스 노드들(B, A)이 페이지(P3)에 저장될 때, 인덱스 노드(A)의 포인터는 인덱스 노드들(C, B)이 저장된 페이지들(P1, P2)을 지정하고, 인덱스 노드(B)의 포안터가 리프 노드들(D, E)이 저장된 페이지들(P3, P2)을 지정하므로 페이지(P2)에 저장된 인덱스 노드(B)는 무효화된다. Similarly, the leaf node (D) and the index nodes (B, A) when it is stored in a page (P3), Pointer to the index node (A) is the index nodes (C, B) of the stored pages (P1, P2 ) the index node (B) stored in a page (P2) the designation, and in the Pho anteo of the index node (B) leaf nodes (D, E) so specify the (P3, P2), the cached page is invalidated. 즉, 페이지(P2)에 저장된 인덱스 노드(B)에 대한 액세스는 발생하지 않는다. That is, access to the index node (B) stored in a page (P2) does not occur. 다시 말하면, 마지막 페이지(P3)의 루트 노드인 인덱스 노드(A)로부터 자식 노드들 순으로 검색이 이루어지므로, 페이지(P1)에 저장된 인덱스 노드(A) 및 페이지(P2)에 저장된 인덱스 노드들(A, B)에 대한 실제 액세스는 이루어지지 않는다. In other words, the index node is stored in the last page (P3) the root node of a search using the child node order from the index node (A) so done, the page index node (A) and a page (P2) stored in (P1) of ( the actual access to the a, B) is not performed. 도 4는 본 발명의 바람직한 실시예에 따라서 도 3에 도시된 플래시 메모리에 저장된 μ-트리의 리프 노드를 수정하는 스킴을 개념적으로 보여준다. Figure 4 shows a scheme for modifying a leaf node of μ- tree stored in the flash memory shown in Figure 3 in accordance with a preferred embodiment of the present invention. 도 4를 참조하면, 리프 노드(F)에 대한 수정을 위하여 리프 노드(F) 뿐만 아니라 인덱스 노드들(C, A)도 수정되어야만 한다. 4, should be also modified, as well as the leaf node (F) of the index nodes (C, A) for the modification to the leaf node (F). 왜냐하면, 수정된 리프 노드(F')가 새로운 페이지(P4)에 저장된다면 리프 노드(F')를 지정하는 인덱스 노드(C)는 페이지(P1) 대신에 페이지(P4)를 지정하도록 포인터를 수정한 인덱스 노드(C')로 정정되어야 하고, 인덱스 노드(A)는 인덱스 노드(C')를 지정하기 위해서 포인터를 수정한 인덱스 노드(A')로 정정되어야 한다. Because, if the store a new page (P4) a leaf node (F modified leaf node (F), the index that specifies) the node (C) by modifying the pointer to point to the page (P4) in place of the page (P1) 'to be corrected, and the index node (a) is an index node (C index node (C)' to be corrected by the index node (a ') by modifying the pointer to specify). 여기서, 프라임(') 표시는 리프/인덱스 노드의 키 값/포인터가 정정되었음을 의미한다. Here, the prime ( ') mark indicates that the key value / pointer correction of the leaf / node index. 정정된 노드들(F', C', A')은 페이지(P4)에 저장된다. The corrected node (F ', C', A ') is stored in a page (P4). 즉, 하나의 리프 노드(F)에 대한 수정을 위해서 오직 하나의 페이지(P4)에 대한 기입 동작이 수행된다. That is, it is only performing a writing operation for one page (P4) to the modification of one of the leaf nodes (F). 그러므로, 리프 노드에 대한 수정 동작에 소요되는 시간이 단축되고 플래시 메모리 사용이 최소화된다. Therefore, the time required to modify the operation of the leaf nodes and shorten the flash memory used is minimized. 이와 같은 본 발명의 색인 스킴에 의하면 플래시 메모리에 대한 기입 횟수가 최소화되어서 플래시 메모리의 수명이 연장될 수 있다. Thus, according to the same index scheme of the present invention be minimized, the number of times the writing of the flash memory can be extended life of the flash memory. 도 4에 도시된 플래시 메모리(h)에서 리프 노드에 대한 검색이 수행될 때 우선 마지막 페이지(P4)에 저장된 인덱스 노드(루트 노드)(A')부터 자식 노드 순으로 검색이 이루어진다. Also in the flash memory (h) shown in Figure 4, when the search for the leaf node is made to perform priority index node (root node) (A ') as a child node, the search is stored in order from the last page (P4). 즉, 인덱스 노드(A')는 인덱스 노드들(B, C')을 지정하고, 인덱스 노드(B)는 리프 노드들(D, E)을 지정하며, 인덱스 노드(C')는 리프 노드(F')를 지정한다. That is, the index node (A ') is the index nodes (B, C' and specify s) specify, and the index node (B) is a leaf-node (D, E), the index node (C ') is a leaf node ( F designates a '). 이와 같은 본 발명의 플래시 메모리를 위한 색인 스킴은 μ-트리의 검색 스킴에 적합하다. Such indexing scheme for a flash memory of the present invention is suitable for the search scheme of the μ- tree. 도 5는 본 발명의 바람직한 실시예에 따라서 도 3에 도시된 플래시 메모리에 저장된 μ-트리에 새로운 리프 노드를 삽입하는 스킴을 개념적으로 보여준다. Figure 5 shows a scheme of inserting the new leaf node to the μ- tree stored in the flash memory shown in Figure 3 in accordance with a preferred embodiment of the present invention. 리프 노드(G)를 삽입하고자 할 때 리프 노드(G)와 관련있는 부모 노드들 즉, 인덱스 노드들(C, A)이 정정되어야한다. When trying to insert the leaf node (G) to the leaf node (G) associated with the parent node, which means that, to be a correction of the index nodes (C, A). 도 5를 참조하면, μ-트리(i)에 삽입된 리프 노드(G) 및 수정된 인덱스 노드들(C', A')이 플래시 메모리(j)의 페이지(P4)에 저장된다. Referring to Figure 5, a tree μ- (i) to the leaf node (G) and a modified index nodes into the (C ', A') is stored in the page (P4) of the flash memory (j). 수정된 인덱스 노드(C')는 리프 노드(F)가 저장된 페이지(P1) 및 리프 노드(G)가 저장된 페이지(P4)를 지정하기 위한 포인터를 포함한다. The modified index node (C ') comprises a pointer for specifying a leaf node (F) is stored in the page (P1) and a leaf node (G) is stored pages (P4). 이와 같이, 새로운 리프 노드의 삽입 동작 또한 한 번의 쓰기 동작에 의해서 수행될 수 있음을 알 수 있다. In this way, insertion operation of the new leaf node may also know that they can be performed by a single write operation. 만일 새로운 리프 노드(G)의 삽입 후 인덱스 노드(C')가 곽 차면 인덱스 노드(C')에 대한 분할(split)가 수행되어야 한다. Ten thousand and one to the divided (split) on the new leaf node (G) insertion after the index node (C ') becomes the cartons index node (C') a to be performed. 이는 추후 상세히 설명된다. This is described further below. 도 6은 본 발명의 바람직한 실시예에 따라서 도 3에 도시된 플래시 메모리에 저장된 μ-트리의 리프 노드를 삭제하는 스킴을 개념적으로 보여준다. Figure 6 shows a scheme of deleting the leaf node of the μ- tree stored in the flash memory shown in Figure 3 in accordance with a preferred embodiment of the present invention. 도 6을 참조하면, μ-트리(k)에서 리프 노드(E)를 삭제하고자 할 때 리프 노드(E)와 관련있는 부모 노드들 즉, 인덱스 노드들(B, A)이 정정되어야 한다. Referring to Figure 6, if you want to delete the leaf node (E) in the tree μ- (k) associated with the leaf node (E) that is a parent node, to be the correction of the index nodes (B, A). μ-트리(i)에서 삭제된 리프 노드(E)와 관련있는 수정된 인덱스 노드들(B', A')이 페이지(P4)에 저장된다. The modified index node associated with the leaf node (E) deleted from the tree μ- (i) (B ', A') is stored in a page (P4). 수정된 인덱스 노드(B')는 리프 노드(D)가 저장된 페이지(P3)를 지정하며, 수정된 인덱스 노드(A')는 수정된 인덱스 노드(B') 및 인덱스 노드(C)를 지정한다. The modified index node (B ') is a leaf node (D) is specified, the stored page (P3), and a modified index node (A' to) specifies the revised index node (B ') and an index node (C) . 플래시 메모리(l)의 페이지(P5)에는 수정된 인덱스 노드들(A', B')이 저장된다. Page of the flash memory (l) (P5), the modification of the index nodes (A ', B') is stored. 도 7은 본 발명의 바람직한 실시예에 따라서 도 6에 도시된 플래시 메모리에 저장된 μ-트리의 리프 노드를 삭제하는 스킴을 개념적으로 보여준다. 7 shows a scheme of deleting the leaf node of the μ- tree stored in the flash memory shown in Figure 6 in accordance with a preferred embodiment of the present invention. μ-트리(m)에서 리프 노드(D)를 삭제하고자 할 때 리프 노드(E)와 관련있는 부모 노드들 즉, 인덱스 노드들(B, A)이 정정되어야 한다. When you want to delete the leaf node (D) in the μ- tree (m) of the leaf node (E) and associated with a parent node that is, the index node (B, A) to be corrected. 도 6을 참조하면, μ-트리(m)에서 리프 노드(D)를 삭제하면, 인덱스 노드(B)는 어떠한 리프 노드도 지정하지 않는다. Referring to Figure 6, if you delete the leaf node (D) in the μ- tree (m), the index node (B) does not specify any leaf node. 그러므로, 자식 노드가 없는 인덱스 노드(B)는 삭제되어야 한다. Therefore, the index node (B) do not have child nodes are to be deleted. 루트 노드인 인덱스 노드(A)는 인덱스 노드(C)가 저장된 페이지(P5) 만을 지정하게 되므로 인덱스 노드(C)는 루트 노드로 정정될 수 있다. The root node of the index node (A) is designated so that only the page (P5), the index node (C) stored in the index node (C) can be corrected to the root node. 즉, 인덱스 노드(C)는 루트 노드로 변경되며, 리프 노드들(F, G)이 저장된 페이지들(P1, P4)을 지정한다. That is, the index node (C) will be changed to the root node, the leaf node specified by the (F, G) of the stored pages (P1, P4). 도 6 및 도 7에 도시된 바와 같이, 리프 노드를 삭제하기 위한 동작은 플래시 메모리에 한 번의 쓰기 동작에 의해서 달성될 수 있다. 6 and the operation for deleting a leaf node as shown in Figure 7 can be accomplished by a single write operation to the flash memory. 리프 노드에 대한 삭제 동작에 소요되는 시간이 단축되고 플래시 메모리 사용이 최소화된다. Shorten the time required for the erase operation for a leaf node and the flash memory used is minimized. 본 발명의 색인 스킴은 플래시 메모리에 대한 기입 횟수를 최소화시킴으로써 플래시 메모리의 수명을 연장한다. The index scheme of the present invention is to extend the life of the flash memory by minimizing the number of times the writing of the flash memory. 앞서 설명한 바와 같이 μ-트리의 리프 노드에 대한 수정, 삽입 또는 삭제는 리프 노드부터 루트 노드까지 순차적으로 이루어지고, 수정, 삽입 또는 삭제되는 리프 노드와 관련된 비리프 노드 즉, 인덱스 노드들은 한 페이지에 저장된다. The modification to the leaf node of the tree μ-, insertion or deletion is made one by one from the leaf node to the root node, the modified, non-leaf nodes, that is, index nodes are one-page associated with the leaf node is inserted or removed, as described previously It is stored. 그러므로, 플래시 메모리의 한 페이지는 리프 노드부터 루트 노드까지 모두 저장 가능하도록 설계되어야 한다. Therefore, one page of the flash memory should be designed to save everyone from the leaf nodes to the root node. 도 8은 높이(H)의 증가에 따라서 한 페이지에 저장되는 리프/인덱스 노드의 최대 저장 가능 크기의 변화를 보여준다. Figure 8 shows the increase in the maximum storage size can change in the leaf / node index that is stored in one page according to a height (H). 도 8을 참조하면, μ-트리의 높이가 증가함에 따라서 한 페이지에 저장되는 리프/인덱스 노드의 최대 저장 가능 크기가 변화한다. 8, according as the height of the μ- tree increases, a page has the maximum storable amount of the leaf / node index change that is stored in. 플래시 메모리의 한 페이지의 크기가 4096byte 일 때 높이(H)가 1이면 루트 노드인 인덱스 노드(811)의 크기는 4096byte 전체이다. The size of the flash when the size of one page of memory 4096byte If the height (H) 1 root node of the index node 811 is a full 4096byte. 높이(H)가 2이면, 루트 노드인 인덱스 노드(821)의 크기는 2048byte이고, 리프 노드(821)의 크기 또한 2048byte이다. If the height (H) is 2, the size of the root node of the index node 821 is 2048byte, and also 2048byte size of the leaf node 821. 높이(H)가 3으로 증가하면 루트 노드인 인덱스 노드(831) 및 인덱스 노드(832) 각각의 크기는 1024byte이고, 리프 노드(833)의 크기는 2048byte이다. When the height (H) is increased to three sizes of the root node of the index nodes (831) and the index nodes (832), and each size is 1024byte, leaf node 833 is a 2048byte. 높이(H)가 4로 증가하면 루트 노드인 인덱스 노드(841), 인덱스 노드(842) 각각의 크기는 512byte이고, 인덱스 노드(843)는 1024byte 그리고 리프 노드(844)의 크기는 2048byte이다. And when the height (H) is increased to 4, the root node of the index node 841, index nodes 842 each size 512byte, the index node 843 is the size of 1024byte and leaf node 844 2048byte. 즉, 높이(H)가 증가함에 따라 리프 노드들(822, 833, 844)의 크기는 2048byte로 유지되나, 높이(H)가 증가할 때마다 루트 노드들(811, 821, 831)의 크기는 1/2씩 감소한다. That is, the size of the height (H) is increased leaf nodes (822, 833, 844) size is the root node (811, 821, 831) each time increased but maintained at 2048byte, height (H) of the as is decreased by one-half. μ-트리가 플래시 메모리에 저장될 때 μ-트리의 최대 높이는 루트 노드의 데이터 크기 및 플래시 메모리의 한 페이지의 크기에 따라서 결정됨을 알 수 있다. When μ- tree is stored in the flash memory up to the height of the μ- tree it can be seen as determined in accordance with a page of the size of the root node data, and flash memory. 또한 하나의 트리 내에서의 레벨에 따라서 각 인덱스/리프 노드의 최대 크기가 다르다. Additionally, the maximum size of each index / leaf node depends on the level in a tree. 예컨대, 높이(H)가 4일 때 4-레벨인 리프 노드(844)의 최대 크기는 2048 bytes이고, 3-레벨인 인덱스 노드(843)의 최대 크기는 1024bytes, 2-레벨인 인덱스 노드(842)의 최대 크기는 512bytes 그리고 1-레벨인 루트 노드(841)의 최대 크기는 512bytes이다. For example, the height (H) is 4 days when 4 level, the maximum size of the leaf node 844 is 2048 bytes and the maximum size of the three-level node of the index 843 is 1024bytes, 2- level of the index nodes (842 ) up to the size of the maximum size of 512bytes 1-level is the root node 841 is 512bytes. 도 8에 도시된 예에서 루트 노드와 루트 노드 바로 아래의 인덱스 노드의 크기의 비는 1:1이다. Also the ratio of the size of 8 in the example shown in the root node and the root node index node immediately below 1: 1. 예컨대, 높이(H)가 2일 때 루트 노드(821)와 리프 노드(822)의 크기 비는 1:1이고, 높이(H)가 3일 때 루트 노드(831)와 인덱스 노드(832)의 크기 비도 1:1이며, 높이(H)가 4일 때 루트 노드(841)와 인덱스 노드(842)의 크기 비도 1:1이다. For example, the height of the root node 821 and leaf node 822 size ratio is 1 at the time (H) is 2: 1, and the height (H) is 3 when the root node 831, and the index nodes (832) a 1: size non 1: 1, and the height size of the first non-root node 841 and the index nodes (842) when (H) is 4 days. 이와 같은 페이지 크기에 대한 레이아웃은 다음 수학식 1과 같이 일반화하여 나타낼 수 있다. Layout for such a page size may be represented by generalization as shown in Equation 1. 수학식 1에서, P는 한 페이지의 크기, H는 트리의 높이, L은 레벨을 나타내며, N L 은 한 페이지 내에서 각 L-레벨의 노드가 차지하는 크기를 나타내고, p L 은 한 페이지의 크기에 대한 L-레벨의 상대적 크기 비율을 나타낸다. 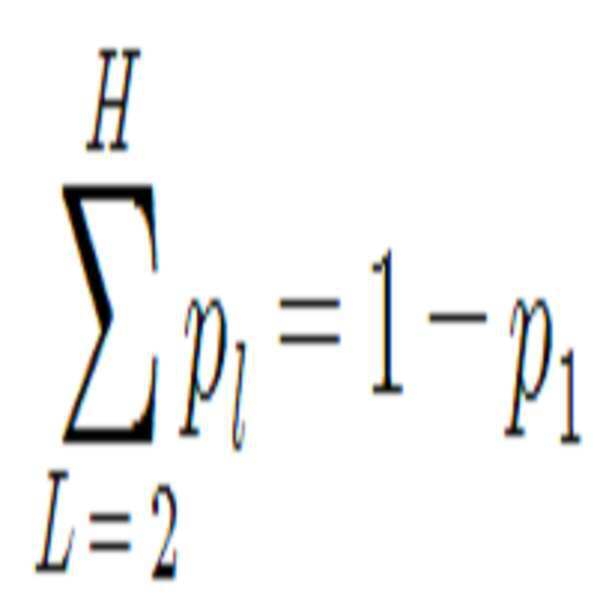 In Equation 1, P size, H is the height of the tree of the one page, L represents a level, N L represents the size of nodes in each level occupying L- on a single page, p L is the size of one page It shows the relative size ratio of the L- level for. 여기서, L은 1보다 크거나 같고, H보다 작거나 같다. Here, L is greater than or equal to 1 and less than or equal to H. L이 1인 노드는 리프 노드이고, L이 H인 노드는 루트 노드이다. Node L is 1, is a leaf node, the node L is H is a root node. 도 8에 도시된 μ-트리의 p L 은 (1/2) L-1 이다. P L of the μ- tree shown in Fig. 8 is a (1/2) L-1. p L 이 (1/2) L-1 로 고정되므로, 트리 높이(H)가 일정하게 유지되는 동안 모든 페이지들의 레이아웃이 동일하게 유지된다. Since p L is fixed to the L-1 (1/2), the layout of all pages during the tree height (H) is maintained constant remains the same. 본 발명에서는 높이(H)가 변화할 때뿐만 아니라 높이가 변화하지 않더라도 페이지에 저장된 엔트리의 개수가 변화하면 페이지 레이아웃을 변경하는 방법을 제공한다. When the present invention, the height (H) is the number of entries stored in page without changing the height, as well as changes to change provides a method for changing the layout of the page. 이와 같이 페이지 레이아웃을 변경시키는 이유는 트리 높이(H)의 증가를 지연 또는 최소화시키기 위해서이다. 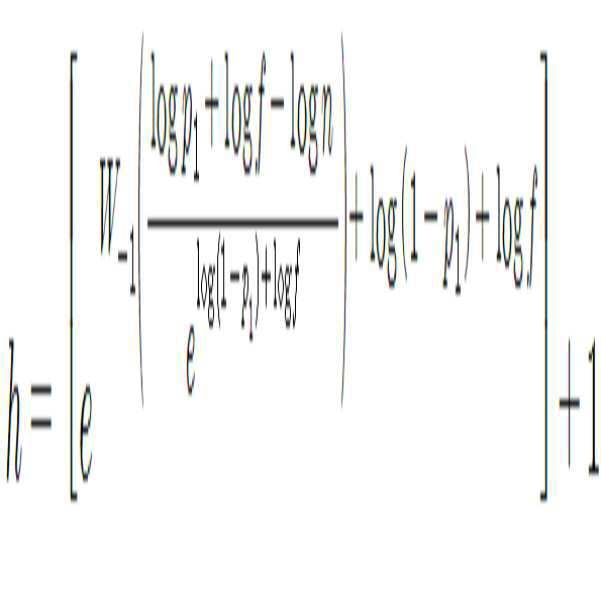 The reason of changing the page layout in order to delay or minimize the increase of the tree height (H). 트리 높이(H)가 증가하면 참조 및 업데이트는 물론 가비지 콜렉션(gabage collection)에 소요되는 부하가 급격히 증가하기 때문이다. When the tree height (H) to increase the load required for the reference and update as well as garbage collection (collection gabage) due to rapidly increasing. 먼저 페이지에 저장된 엔트리 개수에 대한 최적의 페이지 레이아웃을 결정하기 위한 이론적인 방법이 설명된다. First, a theoretical method for determining the best layout for the page entry number stored in the page is described. 우선, 트리 높이(H)와 1번째 레벨의 크기 비율(p 1 ) 즉, 리프 노드의 크기 비율이 주어졌을 때 나머지 레벨들의 최적의 크기 비율을 구하는 방법은 다음과 같다. First, the tree height (H) of the first size ratio of the second level (p 1) that is, how, when the size ratio of a given leaf node to obtain the optimum size ratio of the remaining level is as follows. 루트 노드부터 2-레벨 노드까지 각각의 노드에 포함될 수 있는 엔트리의 총 개수(n I )는 수학식 2와 같다. The total number of entries that may be included in each node from the root node to a two-level node (n I) is equal to the equation (2). 수학식 2에서 f H 는 플래시 메모리의 한 페이지에 저장될 수 있는 엔트리의 최대 개수이다. F H In the equation (2) is the maximum number of entries that can be stored in one page of the flash memory. 한편, μ-트리는 루트 노드에서 리프 노드에 이르는 모든 노드들이 한 페이지에 저장되는데, 이로부터 수학식 3이 성립된다. On the other hand, μ- tree there is any node reaches the root node to the leaf nodes are stored in one page, from which Equation 3 is established. 수학식 2와 수학식 3 그리고 산술 기하 평균 부등식(AM-GM inequality)을 이용하면 수학식 4와 같이, 어느 한 페이지 내 각 레벨의 노드에 할당된 크기가 동일할 때 n I 가 최대가 됨을 알 수 있다. Using Equation 2 and Equation 3, and the arithmetic geometric mean inequality (AM-GM inequality) when seen that the maximum of the n I when the same has been allocated to the node of each level of any one page, as shown in Equation (4) can. 높이가 H인 트리에 저장된 엔트리의 총 개수(n)는 수학식 5와 같다. 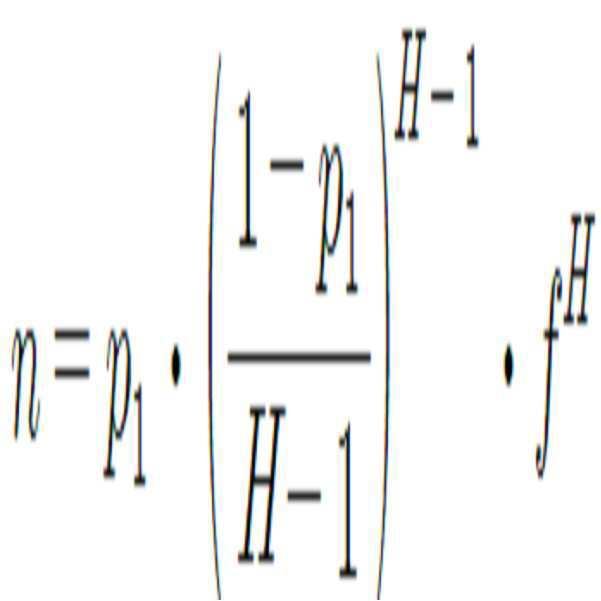 Total number of entries stored in the tree height H (n) is equal to the equation (5). 또한 주어진 엔트리의 총 개수(n)를 수용하기 위해서 필요한 최소한의 트리 높이(h)는 수학식 6으로부터 구해질 수 있다. In addition, at least tree height (h) required to accommodate the total number (n) of a given entry can be found from equation (6). 수학식 6에서 W -1 은 K= -1일 때 Lambert W 함수이다. 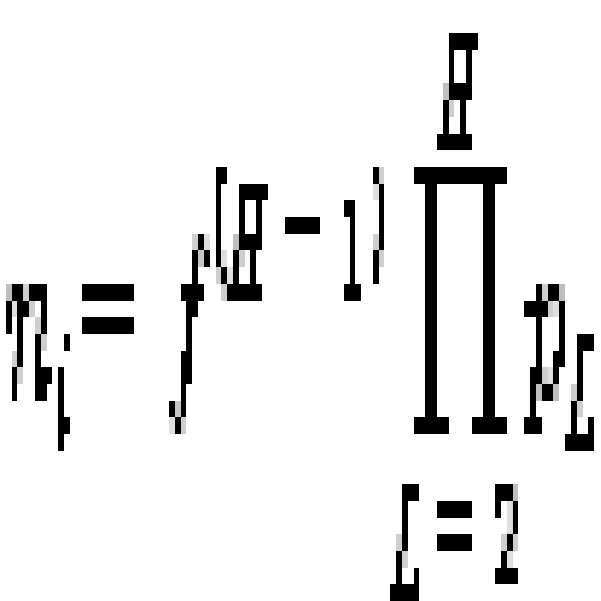 In Equation 6 W -1 is a Lambert W function, when K = -1. 가비지 콜렉션 횟수는 플래시 메모리에서 트리가 차지하는 페이지의 수뿐만 아니라 트리의 높이에도 영향을 받는다. The number of garbage collection as well as the number of pages occupied by the tree in the flash memory affected by the height of the tree. 그러므로 가비지 콜렉션을 최소화할 수 있는 최적의 페이지 레이아웃 설계가 요구된다. Therefore, the optimal page layout designed to minimize the garbage collection is required. 즉, 트리가 차지하는 페이지의 수와 트리의 높이를 최소화될 때 가비지 콜렉션 횟수가 감소될 수 있다. In other words, the number of garbage collection can be reduced when minimizing the number and height of the tree, the tree of pages occupied. 그러나, 트리가 차지하는 페이지 수를 최소화하기 위해서는 리프 노드가 차지하는 페이지 내 크기를 최대화해야 하고, 그러기 위해서 중간 노드인 인덱스 노드의 크기가 감소해야하므로 트리의 높이는 높아진다. However, since the tree is to minimize the number of accounts page, and to maximize the size of your page is a leaf node occupied, should the size of the intermediate node node index decreased to do so increases the height of the tree. 그러므로 트리가 차지하는 페이지의 수 및 트리의 높이 간에 적절한 조화가 필요하다. Therefore, the appropriate harmony is required between the number and height of the tree, the tree of pages occupied. (1) 최소 트리 높이(h)는 p 1 =0.5일 때 주어진 엔트리 개수 n에 대하여 수학식 6을 만족하는 최소값으로 결정한다. (1) Minimum tree height (h) is 1 when p = 0.5 to determine the minimum value that satisfies the equation (6) for a given number of entries n.
(2) p 1 은 주어진 엔트리 개수(n)와 트리의 최소 높이(h)에 대해 수학식 5를 만족해야 한다. 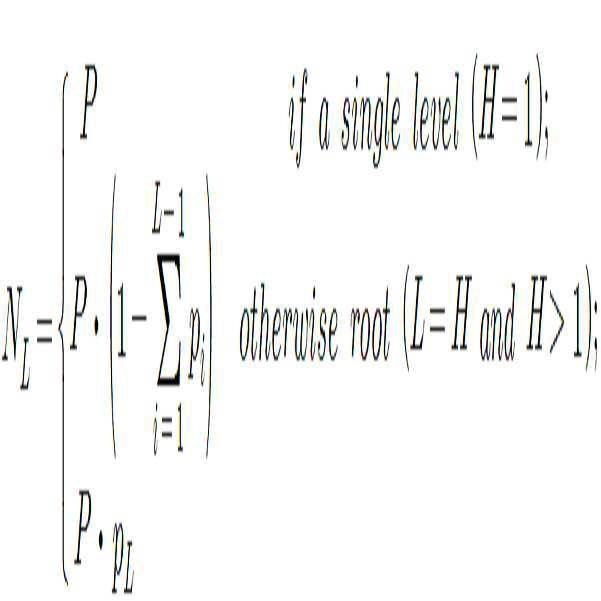 (2) p 1 should satisfy the equation (5) to the minimum height (h) of a given entry number (n) to the tree. (3) p L (1 < L <= H)은 수학식 4에 의해서 결정된다. 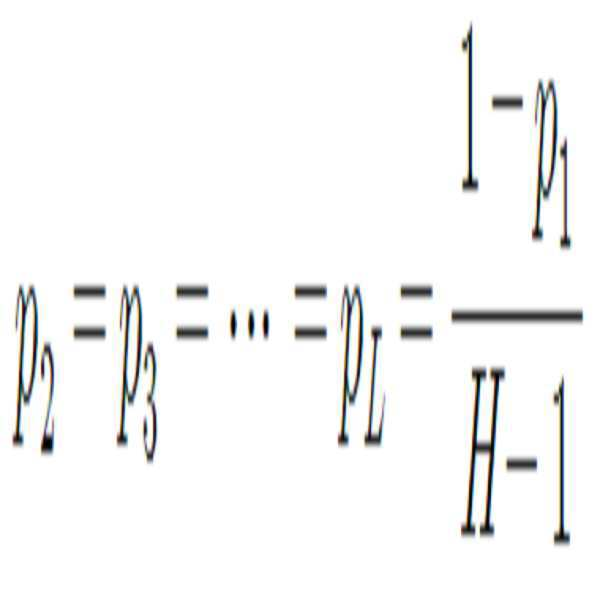 (3) p L (1 < L <= H) is determined by the equation (4). 이와 같은 규칙에 의해서 최적의 p 1 이 구해질 수 있다. By this rule can be the optimum p 1 sphere. 도 9를 참조하면, 트리 높이(H)가 2이고, 트리 내 엔트리의 수가 증가함에 따라서 리프 노드가 차지하는 크기 비율(p 1 )이 점점 감소한다. 9, a tree height (H) is 2, and therefore increases, the leaf nodes occupied size ratio (p 1) decreases more and the number of entries within the tree. 리프 노드가 차지하는 크기 비율(p 1 )이 감소하면 루트 노드의 크기 비율은 증가할 것이다. When a leaf node is occupied by the size ratio (p 1) is reduced in size ratio of the root node will increase. 리프 노드가 차지하는 크기 비율(p 1 )은 O.5 근방까지 감소하다가 트리 높이(H)가 3으로 증가하면 수학식 4를 만족하는 최소값의 p L 이 설정되고 그에 따라서 리프 노드가 차지하는 크기 비율(p 1 )은 최대가 된다. The leaf nodes occupied size ratio (p 1) is O.5 while reduced to the vicinity of the tree if the height (H) is increased to 3, and p L of the set minimum value satisfying the equation (4) and accordingly the size ratio is a leaf node, which accounts ( p 1) is a maximum. 이와 같은 방법으로 한 페이지에서 리프 노드부터 루트 노드까지의 크기 즉, 페이지 레이아웃이 결정된다. The size of a page in the same way from the leaf node to the root node, i.e., the page layout is determined. 그러나 이와 같은 페이지 레이아웃 결정 방법은 트리에 저장되는 엔트리의 총 수(n)가 고정되어 있다는 가정에 기반한 것으로, 플래시 메모리가 실제로 동작하는 환경에서는 엔트리의 수를 예측하는 것이 어렵다. However, such page layout determination method that is based on the assumption that a fixed total number (n) of entries that are stored in the tree, in the environment in which the flash memory is in action, it is difficult to predict the number of entries. 따라서 본 발명에서는 엔트리의 수가 변화함에 따라서 페이지 레이아웃을 적응적으로(adaptive) 변경할 수 있는 방법을 제안한다. Therefore, the present invention proposes a method in accordance with the page layout change as the number of entries can be changed adaptively (adaptive). 단 트리 내 모든 페이지들의 레이아웃을 수정하는 것이 아니라 삽입, 삭제, 정정에 의해서 새롭게 기입되는 페이지에 대해서만 레이아웃이 변경됨을 유의해야 한다. Single tree only for the page not to modify the layout of all pages that are newly written by the insertion, deletion, correction should be noted that the layout is changed. 트리의 페이지 레이아웃 변경에 사용되는 파라미터는 α,β,γ이다. Parameters used in the page layout change of the tree is the α, β, γ. 여기서, α와 β 각각은 리프 노드가 차지하는 크기 비율(p 1 )의 최대값과 최소값이다. Here, α and β, respectively, and is a maximum value of the magnitude ratio is a leaf node, which accounts (p 1) minimum. 즉, 리프 노드가 차지하는 크기 비율(p 1 )은 β <= p 1 <= α 범위 내에서 변경된다. That is, the size ratio of the leaf nodes occupied by (p 1) is changed in the β <= p 1 <= α range. 페이지 레이아웃이 변경되는 경우는 두 가지이다. If the page layout that is changed in one of two ways. 하나는 리프 노드에 엔트리가 삽입되는 경우이고, 다른 하나는 리프 노드에서 엔트리가 삭제되는 경우이다. One is a case where an entry is inserted in the leaf node, and the other is the case where the entry is removed from the leaf node. 도 10a 내지 도 10c는 리프 노드에 새로운 엔트리가 삽입될 때 페이지 레이아웃의 변경을 예시적으로 보여주고 있고, 도 11은 플래시 메모리의 리프 노드에 새로운 엔트리를 삽입하는 동작을 보여주는 플로우차트이다. Figure 10a to Figure 10c may show changes to the page layout, when a new entry is inserted in the leaf node by way of example, Figure 11 is a flow chart showing the operation of inserting a new entry in the flash memory, the leaf node. 도 10a는 루트 노드 및 리프 노드로 구성된 본 발명에 따른 새로운 μ-트리(이하 μ*-트리라 칭한다)의 일 예를 보여주고 있고, 도 10b는 도 10a에 도시된 μ*-트리의 리프 노드(X2)에 새로운 엔트리가 삽입 될 때 페이지 레이아웃의 변경 과정을 개념적으로 보여주는 도면이다. Figure 10a is the root node and the new μ- tree according to the invention consisting of a leaf node, to show an example (hereinafter referred to as μ * tree), and Figure 10b is a μ * shown in Fig. 10a-leaf node of the tree when a new entry is inserted in the (X2) is a view showing a process of change of page layout conceptually. 도 10a, 도 10b 및 도 11을 참조하면, μ*-트리는 루트 노드(X1)와 리프 노드(X2)로 구성된다. Figure 10a, 10b, there is shown, see Figure 11, μ * - consists of a tree is a root node (X1) and a leaf node (X2). 페이지(Pj)에서 리프 노드(X2)가 차지하는 크기 비율(p 1 )은 0.9이다. Page (Pj) size ratio is a leaf node (X2) share of (p 1) is 0.9. 즉, 루트 노드(X1)는 최대 10 개의 엔트리를 저장할 수 있고, 리프 노드(X2)는 최대 90 개의 엔트리를 저장할 수 있다. That is, the root node (X1) can store up to 10 entries, a leaf node (X2) can store up to 90 entries. 도 10b에 도시된 예에서, 리프 노드(X2)는 가득 차 있는 상태이다. In the example shown in Figure 10b, the leaf node (X2) is a full state. 플래시 메모리의 색인 방법을 수행하는 장치는, 리프 노드(X2)에 새로운 엔트리를 삽입하는 명령이 수신될 때(S100), 리프 노드(X2)가 가득차 있는 지를 판별한다. Determines whether a device that performs the indexing method of the flash memory, the (S100), a leaf node (X2) when the command for inserting a new entry in the leaf node (X2) to be received full. 리프 노드가 가득차 있으면(S101) 리프 노드(X2)에 대한 분할이 필요하다(S102). If the leaf node is full it is necessary for the partition (S101) a leaf node (X2) (S102). 리프 노드(X2)는 리프 노드들(X21, X22)로 분할된다. The leaf node (X2) is divided into a leaf node (X21, X22). 루트 노드(X1')는 리프 노드들(X21, X22)을 모두 지정해야 한다. The root node (X1 ') shall specify both the leaf node (X21, X22). 이 때, 루트 노드(X1')가 새로운 리프 노드(X22)를 지정함에 따라서 루트 노드(X1')는 가득차게 된다. At this time, the root node (X1 ') is thus the root node (X1 designated as a new leaf node (X22)') is filled. 종래의 μ-트리에서는 루트 노드가 가득차면 높이를 증가시켰으나, 본 발명의 μ*-트리는 루트인 인덱스 노드(X1')가 가득차면(S104) 새로운 엔트리가 삽입된 리프 노드(X22)에 여유 공간이 있는 지를 판별한다(S105). In the conventional μ- sikyeoteuna tree root node if the full increase the height, of the present invention μ * - root of the tree index node (X1 ') is full surface (S104) a new entry is inserted into the free space in the leaf node (X22) it is determined whether there is (S105). 리프 노드(X22)에 여유 공간이 충분하면, 소정 변경 비율(γ)만큼 리프 노드(X22)의 크기를 감소시키고, 인덱스 노드(X1')의 크기를 증가시킨다(S106). Thus when enough free space to the leaf node (X22), as long as reducing the size of the leaf node (X22) predetermined rate of change (γ), and increases the size of the index nodes (X1 ') (S106). 일례로, 페이지(P j+1 )에 저장가능한 최대 엔트리의 수가 100이고, 변경 비율(γ)이 0.05이면 리프 노드(X22)의 크기는 5만큼 감소하고, 루트 노드(X1')의 크기는 C=5만큼 증가한다. In one example, the page and the number 100 of the maximum number of entries that can be stored on the (P j + 1), rate of change (γ) amount of 0.05 is a leaf node (X22) is 5 reduced, and the root node (X1 ') to the size of the increases as C = 5. 새로운 페이지(P j+2 ) 내 루트 노드(X1') 및 리프 노드(X22)의 크기가 변경된 후 루트 노드(X1') 및 리프 노드(X22) 각각의 엔트리들이 플래시 메모리의 페이지(P j+2 )에 저장된다(S107). New page (P j + 2) in the root node (X1 ') page of and the leaf then the size of the node (X22) altered root node (X1') and a leaf node (X22) each entry to the flash memory (P j + is stored in 2) (S107). 만일 리프 노드(X22)의 여유 공간이 충분하지 않으면, 인덱스 노드(X1')는 분할되어야 하고, 이 때 높이(H)는 1만큼 증가한다(S110). If the free space of the leaf nodes (X22) is not enough, the index node (X1 ') will be increased by the division, and the time (H) is a height 1 (S110). 앞서 설명된 바와 같이, 본 발명의 페이지 레이아웃 변경은 엔트리가 수정된 또는 새로운 엔트리가 삽입된 리프 노드를 포함하는 페이지에만 적용된다. As explained above, the page layout change of the present invention is applied only to the page containing the leaf-node entry is modified, or a new entry is inserted. 만일 다량의 엔트리가 리프 노드에 한꺼번에 삽입되면, 루프 노드 또는 인덱스 노드의 분할이 빠르게 진행되고, 트리의 높이가 기대치보다 훨씬 빨리 증가할 수 있다. If a large amount of entries will once inserted into the leaf node, the node loop, or the division of the index nodes are fast-paced, the height of the tree can grow much faster than expected. 왜냐하면, 변경된 리프 노드를 포함하는 페이지의 레이아웃만 정정되고 나머지 페이지들의 레이아웃은 그대로 유지되기 때문이다. This is because the correction, only the layout of the page that contains the changed layout of the leaf nodes and the remaining pages are retained. 그러므로 인덱스 노드의 빈번한 분할이 이루어지면 트리의 높이가 증가하는 것을 지연시키기 위하여 미리 페이지 레이아웃을 조정하는 것이 필요하다. Therefore, it is necessary that the frequency division of the index nodes made, the pre-adjustment the page layout in order to delay the increase in the height of the tree. 또한 도 9a 및 도 9b에서는 높이가 2인 μ*-트리를 일 예로 설명하나 모든 높이의 μ*-트리에 본 발명이 적용될 수 있다. Can be applied to the present invention, the tri-addition, it Figures 9a and 9b are two high μ * - μ * of any one described in height an example a tree. μ*-트리의 높이가 3 또는 3보다 큰 경우, 한 페이지에 루트 노드와 리프 노드뿐만 아니라 인덱스 노드도 저장된다. μ * - when the height of the tree 3, or greater than 3, as well as the root node and the leaf node, the index node is also stored on one page. 이 때 리프 노드의 분할이 이루어지는 경우, 인덱스 노드가 가득차서 인덱스 노드에 대한 분할이 발생할 수 있다. If you made a division of the leaf node, the index server node is full, there is a division of the index nodes may occur. 이 때 앞서 설명된 바와 같이, 소정의 변경 비율(γ)만큼 루트 노드, 인덱스 노드 및 리프 노드의 크기가 변경된다. This time is, to change the size of the root by a predetermined rate of change (γ) node, leaf nodes and index nodes, as previously described. 도 11에 도시된 바와 같이, 리프 노드가 분할될 때마다 리프 노드의 분할 횟수(SP(L))가 카운트된다(S103). 11, the division number is counted (SP (L)) of each leaf node when the leaf node to be divided (S103). 또한 인덱스 노드가 분할될 때마다 인덱스 노드의 분할 횟수(SP(I))가 카운트된다(S111). In addition, the division number is counted (SP (I)) of the index node each time the node split indexed (S111). 단계 S104에서 비록 인덱스 노드가 가득차지 않았더라도, 인덱스 노드의 분할이 빈번하면(S120), 페이지 레이아웃을 변경하기 위해 제어는 단계 S106으로 진행한다. In step S104, even if the index node is not full, you frequently split index node control to change (S120), the page layout, then proceeds to step S106. 리프 노드(X22)의 여유 공간이 충분하면 제어는 단계 S106으로 진행하여 소정의 변경 비율(γ)만큼 리프 노드(X22)의 크기를 감소시키고, 루트 노드(X1')의 크기를 증가시킨다(S106). Then when the free space of the leaf nodes (X22) is sufficient control proceeds to step S106 to reduce the size as much as a leaf node (X22) predetermined rate of change (γ), and increases the size of the root node (X1 ') (S106 ). 인덱스 노드의 분할이 빈번한 지의 여부는 수학식 7로 판별될 수 있다. Whether or not the division of the index nodes frequent may be determined by Equation (7). 즉, 인덱스 노드의 분할 횟수(SP(I))와 리프 노드의 분할 횟수(SP(L))의 비가 페이지 내 인덱스 노드의 크기 비율(1-p 1 )과 리프 노드의 크기 비율(p 1 )의 비보다 크면 인덱스 노드의 분할이 빈번한 것으로 판별된다. 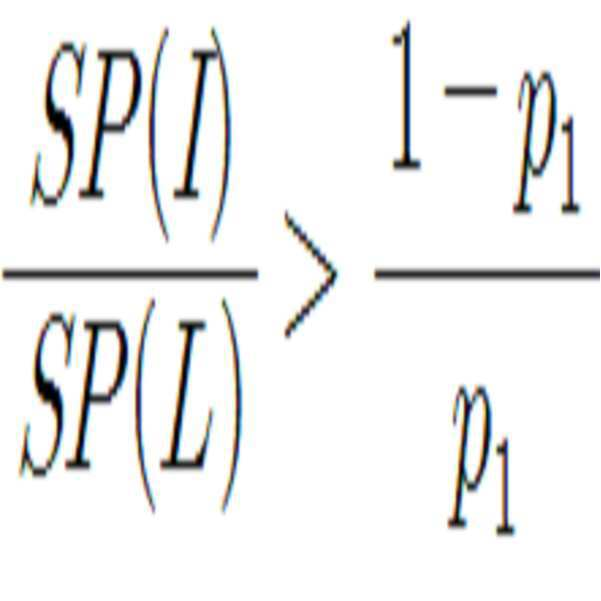 That is, the division number (SP (I)) and the size ratio (1-p 1) and the size ratio of the leaf nodes of the ratio within the index page node of the split count (SP (L)) of the leaf nodes of the index node (p 1) ratio greater than the division of the index nodes is determined that the frequency. 도 10c는 도 10b에 도시된 엔트리 삽입 동작 이후 변화된 μ*-트리를 보여주는 도면이다. Shows a tree-10c are also changed μ * Since the illustrated insert entry operation in FIG. 10b. 도 10b에 도시된 엔트리 삽입 동작 후 페이지 레이아웃은 변경되었으나 μ*-트리의 구조는 그대로 임을 알 수 있다. After the insertion operation shown in Fig entry 10b page layout is changed, but μ * - structure of the tree can be seen that as it is. 이와 같은 방법으로 리프 노드에 새로운 엔트리가 삽입되거나 리프 노드의 엔트리가 정정될 때 트리 높이 증가를 최대한 지연시킬 수 있도록 페이지 레이아웃이 설정될 수 있다. The insert is the same way as a new entry in the leaf node or a leaf node has as the entry to be corrected and the page layout to be able to delay as much as possible to increase the tree height can be set. 도 12a 내지 도 12c는 리프 노드의 엔트리가 삭제될 때 페이지 레이아웃의 변경을 예시적으로 보여주고 있고, 도 13은 플래시 메모리의 리프 노드 내 엔트리를 삭제하는 동작을 보여주는 플로우차트이다. Figure 12a to Figure 12c may show changes to the page layout when deleting the entry of the leaf nodes by way of example, Figure 13 is a flowchart showing the operation for deleting the entry of the flash memory, the leaf node. 도 12a는 높이가 2인 본 발명의 실시예에 따른 μ*-트리의 일 예를 보여주고 있고, 도 12b는 도 12a에 도시된 μ*-트리의 리프 노드 내 엔트리가 삭제될 때 페이지 레이아웃의 변경 과정을 개념적으로 보여주는 도면이다. Figure 12a is a height of μ * according to the second embodiment of the invention - of the page layout when the deletion is in a leaf node entry in the tree - shown an example of a tree, and Figure 12b is a μ * shown in Fig. 12a It illustrates the process of change conceptually. 도 12a, 도 12b 및 도 13을 참조하면, μ*-트리는 루트 노드(Y1)와 리프 노드들(Y2, Y3)로 구성된다. Figure 12a, Figure 12b, and when referring to Fig. 13, μ * - is the tree consists of a root node (Y1) and the leaf node (Y2, Y3). 페이지들(Pk, Pk+1) 각각에서 리프 노드들(Y2, Y3)가 차지하는 크기 비율(p 1 )은 0.85이다. Pages (Pk, Pk + 1) to the leaf nodes at each (Y2, Y3) is occupied by the size ratio (p 1) is 0.85. 즉, 루트 노드(Y1)는 최대 15 개의 엔트리를 저장할 수 있고, 리프 노드들(Y2, Y3)은 최대 85 개의 엔트리를 저장할 수 있다. That is, the root node (Y1) may store up to 15 entries in a leaf node (Y2, Y3) can store up to 85 entries. 도 12b에 도시된 예에서, 리프 노드(Y3)는 1개의 엔트리만을 저장하고 있는 상태이다. In the example shown in Figure 12b, the leaf node (Y3) is a state that stores only one entry. 도 12b 및 13을 참조하면, 플래시 메모리의 색인 방법을 수행하는 장치는 리프 노드(Y3) 내 엔트리 삭제 명령을 수신한다(S200). Referring to Figure 12b, and 13, apparatus for performing the indexing method of the flash memory receives a command for the entry to delete the leaf node (Y3) (S200). 리프 노드(Y3) 내에는 1개의 엔트리만 저장되어 있었고, 그 엔트리가 삭제되면 리프 노드(Y3) 전체가 삭제된다. In the leaf node (Y3) were stored, only one entry, if the entry is deleted, the entire leaf node (Y3) is deleted. 이와 같이 엔트리 삭제에 의해서 리프 노드(Y3)가 비게(empty) 되면(S201) 리프 노드(Y3)는 삭제된다(S202). Once this way the leaf node (Y3) is empty (empty) entry by deleting (S201) a leaf node (Y3) may be removed (S202). 리프 노드(Y3)가 삭제됨에 따라서 수정된 루트 노드(Y1') 내 엔트리 수도 8개에서 7개로 감소한다. The leaf node (Y3) of the root node is deleted (Y1 ') may modify the entry reduced from eight to seven, depending on. 루트 노드의 사용율이 소정의 비율(예를 들면 50%)보다 작으면(S203), 루트 노드 및 리프 노드의 크기는 소정의 비율(γ)만큼 변경된다(S204). If the usage rate of the root node is less than a predetermined ratio (e. G. 50%) (S203), the size of the root node and the leaf node is changed by a predetermined ratio (γ) (S204). 루트 노드(Y1)는 8 개의 엔트리들을 포함하고 있었으나 수정된 루트 노드(Y1')는 7 개만을 포함한다. The root node (Y1) is the root node (Y1 ') but modified to include eight entries includes only seven. 수정된 루트 노드(Y1')는 전체 15 개의 엔트리들을 저장할 수 있으므로, 50% 미만만 사용되고 있다. The modified root node (Y1 ') are used only because it can store a total of 15 entries, less than 50%. 따라서 수정된 루트 노드(Y1')의 크기는 소정의 비율(c)만큼 감소되고, 리프 노드(Y2)의 크기는 소정의 비율(γ)만큼 증가된다. Therefore, the size of the modified root node (Y1 ') is reduced by a predetermined ratio (c), the size of the leaf node (Y2) is increased by a predetermined ratio (γ) of the. 크기가 변경된 루트 노드(Y1') 및 리프 노드(Y2)는 새로운 페이지(P k+2 )에 저장된다(S205). Is stored in the root node (Y1 ') and a leaf node (Y2) is a new page (P k + 2), the size is changed (S205). 리프 노드(Y2)의 크기가 증가함에 따라서 트리의 높이 증가가 최대한 억제될 수 있다. As the size of the leaf node (Y2) increases with an increase in height of the tree can be significantly suppressed. 이 실시예에서, 한 페이지에 저장될 수 있는 엔트리의 수는 100개이고, 크기 변경 비율(γ)이 0.05이면, 수정된 루트 노드(Y1')의 크기는 5만큼 감소된 10이 되고, 리프 노드(Y2)의 크기는 5만큼 증가된 90이 된다. In this embodiment, if the number of entries that can be stored in one page is 100 pieces, the change rate (γ) size of 0.05, the size of the modified root node (Y1 ') is 10 reduced by 5, the leaf node size (Y2) is the increase by 90 5. 도 12c는 도 12b에 도시된 엔트리 삭제 동작 이후 변화된 μ*-트리를 보여주는 도면이다. It shows a tree-12c are also changed μ * after the entry deletion operation shown in Figure 12b. 도 10b에 도시된 엔트리 삭제 동작 후 μ*-트리의 구조는 높이가 2이고, 루트 노드(Y1)와 리프 노드(Y2)를 포함하는 구조로 변경되었다. Even after the entry deletion operation shown in 10b μ * - a tree-like structure has been changed to the structure in which the height is 2, including a root node (Y1) and a leaf node (Y2). 엔트리 제거 동작시 페이지 레이아웃의 변경은 루트 노드의 활용율만을 근거로 한다. Entry change of page layout removal operation will be only based on utilization of the root node. 이는 잦은 페이지 레이아웃 변경에 의한 오버헤드를 최소화하기 위함이다. This is to minimize the overhead due to the frequent page layout change. 앞서 설명된 엔트리 삽입 및 삭제에 따른 페이지 레이아웃 변경 알고리즘을 의사 코드로 기술하면 다음과 같다. When describing the page layout change algorithm according to the entry insertion and removal as described above in pseudo-code as follows. 본 발명의 μ*-트리는 리프 노드, 인덱스 노드 및 루트 노드를 플래시 메모리의 한 페이지에 저장함으로써 엔트리의 삽입 및 삭제에 따른 쓰기 동작 횟수를 현저히 감소시킨다. μ * of the present invention by storing a tree leaf node, the index node and the root node to a page of the flash memory significantly reduces the number of times of writing operation of the insertion and deletion of entries. 특히, 엔트리의 삽입 또는 삭제 동작시 리프 노드 및 인덱스(루트) 노드 내 엔트리의 수에 따라서 페이지 레이아웃을 변경함으로써 플래시 메모리의 쓰기 동작 횟수를 더욱 최소화할 수 있다. In particular, the insertion or deletion operation of the leaf node and the index entry (root) according to the number of nodes in the entry may further minimize the number of times of writing operation of a flash memory by changing the page layout. 도 14를 참조하면, 여러가지 동작 환경들(kernel, postmark, tpcc, financial, general, web)에서 B-트리 및 μ-트리에 비해 본 발명에 따른 μ*-트리의 기입, 삭제 동작의 속도가 향상됨을 알 수 있다. 14, the various operation environments (kernel, postmark, tpcc, financial, general, web) μ * according to the invention compared with the B- tree and tree in the μ- - is written, the erase operation speed of the tree, improved the can be seen. 도 15를 참조하면,μ*-트리의 페이지 레이아웃 변경 방법에 따른 특정 페이지 내 리프 노드가 차지하는 크기 비율(p 1 )의 변화는 도 9에 도시되었던 이론적인 최적값과 거의 유사함을 알 수 있다. Referring to Figure 15, μ * - changes in the page layout change how a specific page within the leaf node, the occupied size ratio according to the tree (p 1) is found to be substantially similar to the theoretical optimal value was shown in Figure 9 . 도 16을 참조하면, 전자 장치(1600)는 시스템 버스(1601)와 연결된 프로세서(1610), 디스플레이(1620), 키패드(1630), 플래시 메모리(1640), ROM(read only memory, 1650) 그리고 RAM(random access memory, 1660)를 포함한다. Referring to Figure 16, the electronic device 1600 to the system bus 1601 and connected to the processor 1610, display 1620, the keypad 1630, the flash memory (1640), ROM (read only memory, 1650) and RAM and a (random access memory, 1660). 이와 같은 구성을 갖는 전자 장치(1600)는 파일 시스템을 플래시 메모리(1640)에 저장한다. The electronic device 1600 has the same configuration and stores the file system in the flash memory (1640). 여기서, 플래시 메모리(1640)는 μ*-트리 구조에 기반한 본 발명의 색인 스킴을 채용한다. Here, the flash memory 1640 is μ * - employs the index scheme of the present invention based on the tree structure. 전자 장치(1600)는 디지털 음악 재생기, 디지털 카메라, 핸드폰, 퍼스널 컴퓨터, PMP(portable multimedia player), 플레이스테이션 등과 같은 기기이다. Electronic device 1600 is a device such as a digital music player, a digital camera, mobile phone, personal computer, PMP (portable multimedia player), PlayStation. 프로세서(1610)는 앞서 설명한 색인 스킴에 따라서 플래시 메모리(1640)의 한 페이지에 μ*-트리의 리프 노드 및 리프 노드와 관련있는 인덱스 노드들을 저장하고, 리프/인덱스 노드에 대한 정정, 삽입, 또는 삭제를 수행할 수 있다. Processor 1610 μ * on one page of the thus flash memory 1640 the previously described index scheme - storing index node associated with the leaf nodes and leaf node in the tree, and the leaf / correction for the index node, inserted, or You may perform the deletion. 또한 리프 노드 및 인덱스 노드 각각에 저장된 엔트리들의 수에 근거하여 정정, 삽입, 또는 삭제 동작시 페이지 레이아웃을 변경할 수 있다. Also you can change the correction, insertion, or deletion operation when the page layout based on the number of entries stored in each of the leaf nodes and index nodes. 도 17을 참조하면, 호스트 (1710)에 메모리 장치(1720)가 연결된다. 17, the memory device 1720 is coupled to the host 1710. 메모리 장치(1720)는 메모리 컨트롤러(1722) 및 플래시 메모리(1724)를 포함한다. The memory device 1720 includes a memory controller 1722 and the flash memory (1724). 메모리 컨트롤러(1722)는 호스트(1710)와 플리 메모리(1724) 사이의 인터페이스를 제공한다. The memory controller 1722 provides an interface between the host 1710 and the replicon memory 1724. 메모리 컨트롤러(1722)와 플래시 메모리(1724)는 원-칩으로 구성되어서 컴팩트 플레쉬(Compact Flash), 스마트 미디어(Smart Media), 메모리 스틱(Memory Stick), SD 카드(Secure Digital Card), 듀얼미디어 카드(MultiMedia Card) 등으로 구현될 수 있다. The memory controller 1722 and the flash memory 1724 is won - be comprised of the chip and compact flash (Compact Flash), smart media (Smart Media), Memory Stick (Memory Stick), SD card (Secure Digital Card), Dual-Media Card It can be implemented in such (MultiMedia Card). 이와 같은 메모리 시스템에서 호스트(1710)는 본 발명의 색인 스킴에 따라서 플래시 메모리(1724)를 액세스할 수 있다. In such a memory system, the host 1710 may access the flash memory 1724 according to the index scheme of the present invention. 특히, 메모리 컨트롤러(1722)는 호스트(1710)로부터의 명령에 응답해서 리프 노드의 엔트리 및 리프 노드를 지정하는 인덱스 노드의 엔트리를 플래시 메모리(1724) 내 동일한 페이지에 저장하고, 리프 노드 및 인덱스 노드 각각의 엔트리들의 수에 근거하여 페이지 레이아웃을 변경하는 동작을 수행한다. In particular, the memory controller 1722 stores the entry of the index node which specifies the entry and leaf node in response to leaf node to a command from the host 1710 to the same page in the flash memory 1724, and the leaf nodes and index nodes based on the number of each entry and performs the operation of changing the page layout. 도 18을 참조하면, 전자 장치(1800)는 도 16에 도시된 전자 장치(1600)의 플래시 메모리(1640) 대신 SSD(Solid State Disk, 1840)를 포함한다. 18, it includes an electronic device 1800 is a flash memory (1640) instead of SSD (Solid State Disk, 1840) of the electronic device 1600 shown in FIG. 전자 장치(1800)의 다른 구성 및 동작은 도 16에 도시된 전자 장치(1600)와 유사하다. Other configurations and operation of the electronic device 1800 is similar to the electronic device 1600 shown in FIG. 프로세서(1810)는 앞서 설명한 색인 스킴에 따라서 SSD(1840)의 한 페이지에 μ-트리의 리프 노드 및 리프 노드와 관련있는 인덱스 노드들을 저장하고, 리프/인덱스 노드에 대한 정정, 삽입, 또는 삭제를 수행할 수 있다. Processor 1810 is a page of a SSD (1840) stores a leaf node and a leaf node associated with the node index of the μ- tree, and leaf / correction for the index node, inserted, or deleted according to the above scheme index It can be carried out. 또한 리프 노드 및 인덱스 노드 각각에 저장된 엔트리들의 수에 근거하여 정정, 삽입, 또는 삭제 동작시 페이지 레이아웃을 변경할 수 있다. Also you can change the correction, insertion, or deletion operation when the page layout based on the number of entries stored in each of the leaf nodes and index nodes. 예시적인 바람직한 실시예를 이용하여 본 발명을 설명하였지만, 본 발명의 범위는 개시된 실시예에 한정되지 않는다는 것이 잘 이해될 것이다. While the invention has been described using exemplary preferred embodiments, the scope of the present invention will be understood well is not limited to the disclosed embodiments. 따라서, 청구범위는 그러한 변형 예들 및 그 유사한 구성들 모두를 포함하는 것으로 가능한 폭넓게 해석되어야 한다. Thus, the claims should be construed broadly as possible to encompass all such modification examples, and the similar configuration. 상기 페이지에 저장되는 상기 리프 노드 내 엔트리들의 수 및 상기 인덱스 노드 내 엔트리들의 수에 근거하여 상기 페이지에서 상기 리프 노드 내 엔트리 및 상기 인덱스 노드 내 엔트리가 각각 저장될 수 있는 최대 개수를 변경하는 것을 특징으로 하는 색인 방법. Characterized in that on the basis of the number of the entry number and the entry the index node of the leaf node is stored in the page to change the maximum number with the entry and the entry the index node, the leaf node can be stored respectively in the page Index method of. 상기 플래시 메모리는 상기 페이지 단위로 독출 또는 기입되는 것을 특징으로 하는 색인 방법. The flash memory is an index characterized in that the read or write to the pages. 상기 인덱스 노드는 적어도 하나의 리프 노드를 지정하는 것을 특징으로 하는 색인 방법. Index characterized in that the said index node specifies the at least one leaf node. 상기 페이지에 복수의 인덱스 노드들이 포함될 때 상기 인덱스 노드들 중 최상위 노드는 루트 노드인 것을 특징으로 하는 색인 방법. When included with a plurality of index nodes on the page top node of said index node index characterized in that the root node. 상기 분할된 상기 제1 및 제2 리프 노드들 중 어느 하나에 상기 새로운 엔트리를 삽입하는 단계를 더 포함하는 것을 특징으로 하는 색인 방법. Index method further comprising the step of inserting a new entry in the any one of the divided first and second leaf node. 상기 리프 노드에 여유 공간이 있을 때 소정의 변경 비율로 상기 페이지에서 상기 리프 노드 내 엔트리 및 상기 인덱스 노드 내 엔트리가 각각 저장될 수 있는 최대 개수를 변경하는 단계를 더 포함하는 것을 특징으로 하는 색인 방법. Index method when the leaf node, there is a free space in the page, at a predetermined rate of change, characterized in that it further comprises a step in which the leaf node in the entry and the entry the index node is changed to the maximum number that can be stored in each . 상기 인덱스 노드의 분할 횟수를 카운트하는 단계를 더 포함하는 것을 특징으로 하는 색인 방법. Index method according to claim 1, further comprising the step of counting the number of division of the index nodes. 상기 리프 노드에 여유 공간이 있을 때 상기 인덱스 노드 내 엔트리가 저장될 수 있는 최대 개수가 증가하도록 상기 페이지에서 상기 리프 노드 내 엔트리 및 상기 인덱스 노드 내 엔트리가 각각 저장될 수 있는 최대 개수를 변경하는 단계를 더 포함하는 것을 특징으로 하는 색인 방법. When the leaf node is a free step of changing the maximum number with the entry and the entry the index node, the leaf node can be stored respectively in the page so as to increase the maximum number which may be the entry is stored in the index node Index method further comprises. (상기 인덱스 노드의 분할 횟수)/(상기 리프 노드의 분할 횟수)가 (1-리프 노드의 크기 비율)/(리프 노드의 크기 비율)보다 큰 지를 비교하는 단계를 포함하는 것을 특징으로 하는 색인 방법. Index method comprising the step of comparing if greater than (size ratio of leaf-node) (the index number of the split node) / (divided number of the leaf node) is (the size ratio of the 1-leaf nodes) / . 상기 루트 노드의 사용률이 상기 기준값 미만일 때 상기 리프 노드 내 엔트리가 저장될 수 있는 최대 개수가 증가하도록 상기 페이지에서 상기 리프 노드 내 엔트리 및 상기 루트 노드 내 엔트리가 각각 저장될 수 있는 최대 개수를 변경하는 단계를 더 포함하는 것을 특징으로 하는 색인 방법. In the page to the utilization of the root node increase the maximum number which may be the entry is stored in the leaf node when less than said reference value for changing the maximum number with the entry and the entry of the root node, the leaf node can be stored in each Index method further comprises the step.